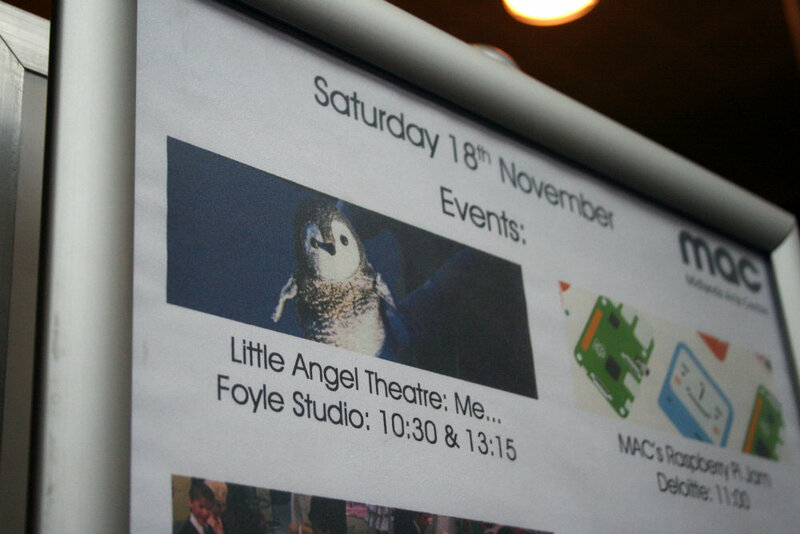 As we took our seats in mac birmingham‘s Foyle Studio, I’ll be honest, I was a bit nervous. The last theatre show we took Pickle to see was Half Moon Theatre’s Leaf at Artrix in Bromsgrove only a couple of weeks prior, and it didn’t go well. He wasn’t very interested in the performance, he squirmed and whined and was more excited about exploring the studio, climbing up on chairs and trying his damnest to get behind the stage screen. It was a pretty stressful half an hour. Although I think the content of the performance had a lot to do with it (I certainly felt it wasn’t engaging enough to hold the attention of an adventurous seventeen month old), I was worried it was an indication that Pickle might not be the right age to take to the theatre. I prepared myself for having another battle on my hands, but I needn’t have worried. After a slightly unsettled start (silly Mommy, I made the mistake of taking his wellies off just before the show began, and he had a few distracted minutes trying to find them and put them back on), I was really impressed with how well the performance captured his attention. The sweeping, dynamic movements of the puppets and clear lighting made sure children knew exactly where to look, and Pickle happily leaned to one side in order to follow the action whenever his sightline was blocked by someone sitting in front. Each sequence was perfectly timed so that something new was introduced just at the point when toddlers’ attention spans need rebooting. Very cleverly done! I honestly couldn’t believe Pickle sat so nicely for the entirety of the forty minute show and that’s a real testament to how expertly this performance has been put together. I enjoyed lovely snuggles with him as we watched penguins climb, slide, swim and frolic in the snow. We saw the sun come up, the rising moon take over, and the night sky come alive with twinkling stars. He took it all in. Every last magical moment. It’s difficult to describe exactly why Me… is so mesmerising. It exudes charm, and for a performance set on an iceberg in the Antarctic, it has incredible warmth that leaves you feeling like you’ve just been held in a forty minute long hug. 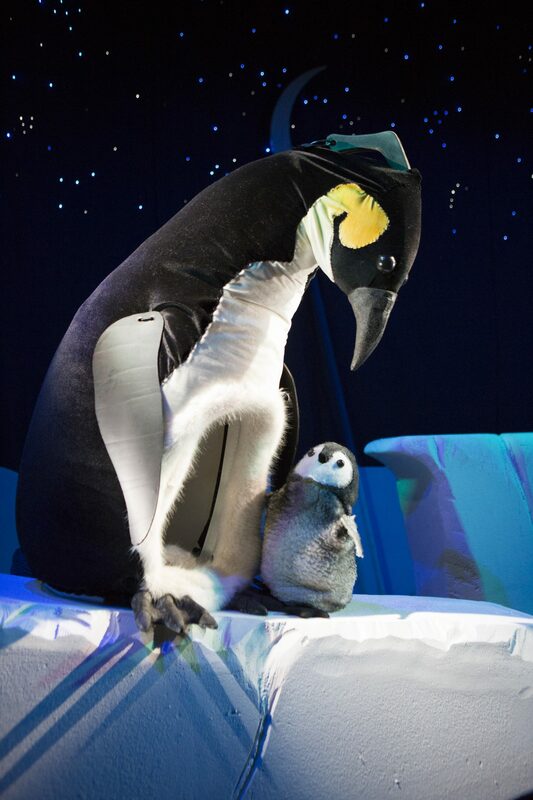 The puppets (four life sized Emperor penguins) are beautifully crafted, and brought to life both physically and vocally with real character. 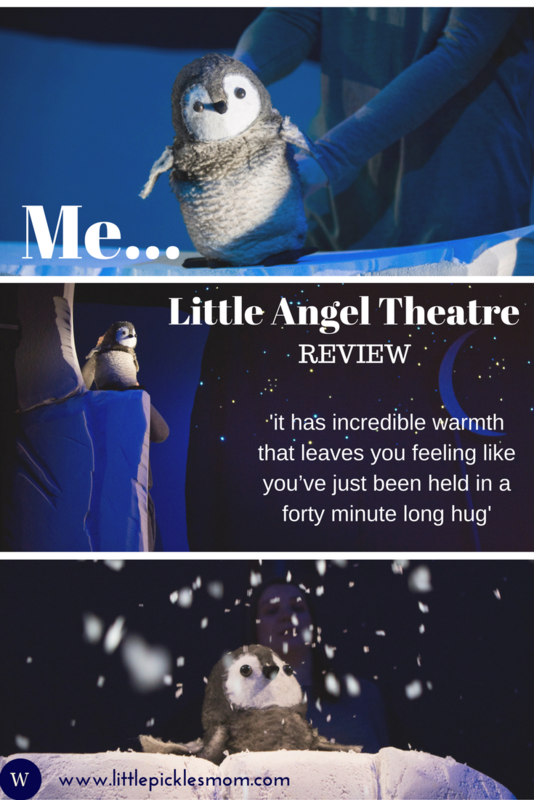 We gasped, squealed and laughed along with the little penguin, her exploration and journey of discovery perfectly mirroring the everyday learning of the little audience members as well. If I had to pick faults, I’d say that occasionally the lighting seemed a little off – sometimes the puppets weren’t quite lit as they moved near the edges of the set and I wasn’t sure if some of the lighting changes during the swimming section were intentional or a mistake. If it was intentional, it might have been better to change some of the choreography (is that what you call puppet manipulation?) during the sections when the sea gauze was lit from the front, as a lot of the movement was lost. But that really is such a minor thing. 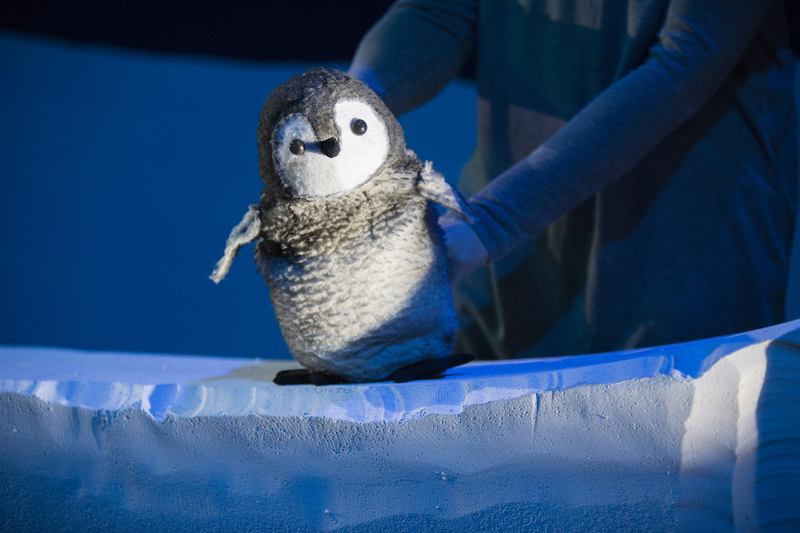 The performance is aimed at two to six year olds, but with Pickle being only seventeen months old he’s proof that Me… can handle slightly younger audience members too. The show runs at mac birmingham until Thursday 30 November, but I’d recommend booking tickets sooner rather than later as a number of performances are already sold out with others only having limited availability left. Once the word gets out about the delights of this Little Angel Theatre creation, I’m sure the remaining tickets will be snapped up. You can even pre-book some milk and cookies to enjoy the performance with, how lovely is that? Me… gets a resounding thumbs up from us, and I’d love as many families as possible to experience this festive treat that truly perfectly caters for toddlers, preschoolers and their parents too. 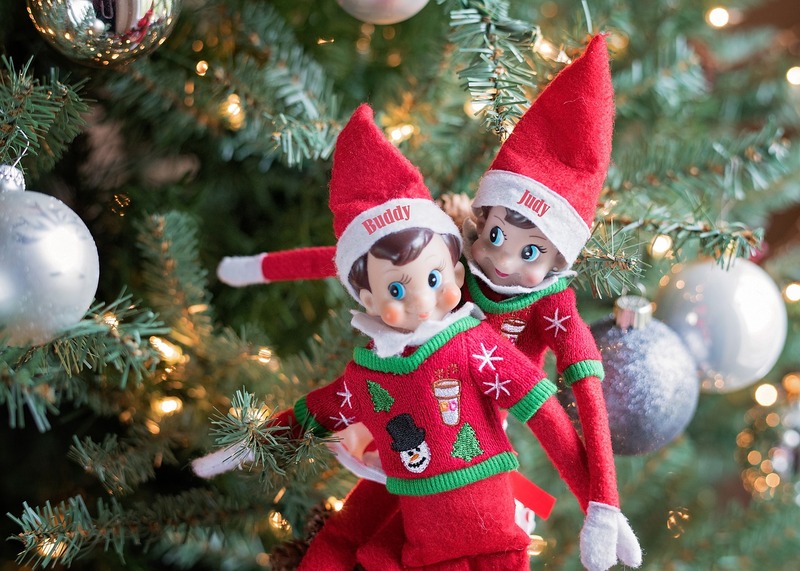 Want to relive the magic at home? Disclaimer: we were issued with press tickets in order to review this performance at mac birmingham. All opinions and views remain my own, and as always, 100% honest. Please note, this post contains Amazon Affiliate links. This doesn’t affect the price you pay but if you do decide to purchase, I will receive a small referrer incentive. Feel free to use this pinnable image if you’d like to save this review for later! That sounds like such a beautiful and quietly magical performance. Will look out for it. A lovely way to introduce kids to theatre. How cute that you can pre-book milk and cookies. Sounds adorable! I can’t wait until my daughter is old enough for the theatre. Never too young in my opinion, Katy! I took Pickle for the first time when he was eight months old – and he’s seen quite a bit since. You’ll be surprised at how much she’ll take in, I reckon. You just have to keep an eye out for shows that are suitable. Where abouts are you, and I’ll keep an eye out for you if you like? 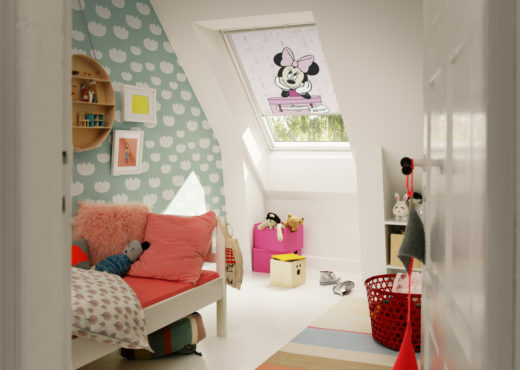 Aww, this looks so sweet. I love watching anything with penguins in it,so does my Daughter 🙂 Sweet.